A woman who threw a kettle of boiling water over a convicted killer at a Derbyshire prison has been jailed for 12 years. Natalie Roberts attacked Josie Hollis while they were both on remand at HMP Foston Hall. Her trial, at Derby Crown Court in December, was told how there had been tensions between them on the wing where they were both based and that Roberts had shouted out ‘murderer’. Hollis, who later admitted to the manslaughter of Sheffield dad Jordan Hill, went into the defendant’s cell to confront her and 35-year-old Roberts then threw the freshly-boiled water over her. When Roberts was found guilty of causing grievous bodily harm with intent, she shouted to the jury that convicted her she would “kill herself and come back to haunt them”. Now she has told a probation officer she “wishes she had killed the b***h” referring to throwing the water over Miss Hollis. Sentencing Roberts, Recorder David Mason QC said: “This was a horrendous offence which has left Miss Hollis with permanent scarring to the left side of her body. “You tried to pour a kettle full of boiling water over her head which I believe shows an intention to cause even more serious injuries than those you did. “I have read your pre-sentence report and in it you said to the probation service on more than one occasion ‘I wish I had killed the b***h’ which does not help your situation. What was said at the trial? The trial was told how how the incident took place in C-Wing at HMP Foston at around 7pm on July 27, 2017. 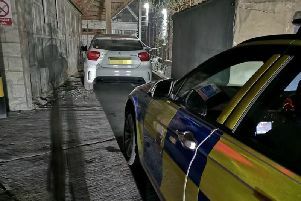 At the time, Miss Hollis was awaiting trial for the murder of 23-year-old Jordan Hill who died shortly after an attack in the hallway of his flat in Southey Avenue, Sheffield, on March 23, 2017. That trial, in February 2018 at Sheffield Crown Court, saw 32-year-old Bradley Onfroy found guilty of murder and robbery and ordered to serve a minimum term of 33 years. Giving evidence at Roberts’ trial in Derby, Miss Hollis said in the build up to the kettle incident the defendant, of Broughton Road, Handsworth, Birmingham, had “constantly abused” her in the communal areas of the jail such as the canteen. It was then that she claims Roberts called out “murderer”. Miss Hollis told the trial: “I was confused so I approached Natalie to ask her what she was on about. “I knew what was coming so I went to turn away but she splashed me over the left side of my face with the boiling water. It was a full kettle of water. Roberts denied one charge of causing grievous bodily harm with intent. She told the jury Miss Hollis splashed herself with the boiling water as the pair of them struggled in her cell with the kettle. Devon Small, for Roberts, said his client has a nine-year-old son and that the arson charge she was on remand in Foston Hall for at the time of the incident was dropped against her. He said: “She did not expect the complainant to come into her cell.